Editor’s Note: In this series of articles from 2016, HJ writer Michael Kane interviews Ranger Up CEO Nick Palmisciano, who is considered by many to be “the Godfather” of modern veteran entrepreneurship. Nick was listed by We Are The Mighty alongside other high-profile veterans like General Stanley McChrystal and Veteran Affairs Secretary Bob McDonald as a “veteran poised for impact” in 2016. In this multi-part series, Nick addresses starting a new business, work/life balance, the pitfalls of politics, and the importance of giving voice to the veteran community. HJ: Nick, thanks for agreeing to this interview and giving up your time to talk with us about veteran entrepreneurship, I know this is a crazy time for business owners everywhere. It’s 10:30 at night on a weeknight… are you still at the warehouse this late? Inside the Ranger Up warehouse. Nick: Yeah man, every night. Honestly, from Black Friday until December 23rd, we are just here. I’m not exaggerating; we are just here. There is somebody here from 7am until typically 3 or 4 in the morning, every day. And then, sometimes Crazy Jack Mandaville just sleeps here because he doesn’t want to drive home. So yeah, it’s just this time of year. In retail we live and die for this time of year. This is the investment for 2016, so if we fail here, then 2016 is challenging. That’s just the way it goes. HJ: That doesn’t sound so different than being in the military! Speaking of which, let’s start the interview there. After graduating West Point, you served as an Infantry officer in the Army and then you decided to leave the military to start your own business. 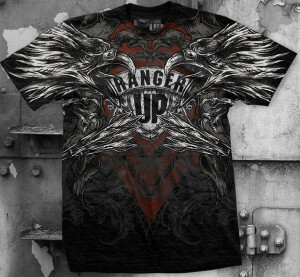 Your company Ranger Up is now an industry leader and a household name within the “veteran lifestyle” community. What made you decide to leave the relative job security of a military career and start up your own business? Nick: Well, there was a step in between there. I got out of the military for two reasons. The 1st reason was my ex-wife did not want to have kids while I was still in the military. She felt like I would absolutely hate being a dad that had to deploy and leave his kids all the time, and frankly, she was right about that. The 2nd reason, is that I was a captain and I didn’t want to be a major. I absolutely loved being a platoon leader, I loved being a captain, I loved being with the guys. I looked at the major jobs and realized there were really no jobs that I wanted to hold as an officer beyond major. And so, it was just a situation where I just needed to do something else because I feel like I’m built to be with the guys, and not built to be an administrator. I just didn’t want to do that. So it was kind of a shocking revelation for me, because I saw myself as a dude that was going to be in the military forever. I got a job with a Fortune 100 company and it was a great company, I’ve got nothing bad to say about them, they treated me very well. I made more money than anybody on either side of my family had ever made at that point. I was 29 years old and making about a quarter million dollars a year. But at the same time, I just felt kind of empty about the whole thing and wasn’t as happy as I thought I would be making a bunch of money and being in that life. So I started this hobby on the side called “Ranger Up.” It was just my way of staying still connected with the military. Here’s how it started: at the time, I was still volunteering with Duke’s ROTC program even though I had already graduated. I was going there every morning and teaching either mixed martial arts (MMA) or small unit tactics and the kids were always complaining about not having cool t-shirts. So that kind of gave me the idea. I made some iron-on shirts for the kids that I was teaching, they thought were really funny, and I just gave them to them. They recommended that I start a website, and I thought about it for a little while and started Ranger Up truly as a hobby, just something I was going to do that was meaningful for me. But obviously I still had this corporate job. And so you know, I jumped into it, and it was really challenging. I almost bankrupted myself, and I went through a divorce at the same time, which was very challenging. At one point I had $50-60k in credit card debt, maxed cards, had cashed in all of my mutual funds and savings, and I had about $1300 to my name. And I was sitting there thinking “Okay, I’m going to have to get a job consulting for some pharmaceutical company or something so that I can keep going with this,” because I’m a moron and the idea of quitting was appalling to me. So I had $1300 to my name and I kind of graded myself every month at the same time, and the next month I had $1350, and the next month I had $1500 and it went from there. There are a lot of highs and lows to entrepreneurship but that was like the 2010 time frame and it’s been significantly better since then, but, a lot of challenges. It’s a tough business.